What is wrong with this picture? It's another Tuesday evening in the chemistry lab. Students are learning about density. The first three days of my workweek are quite busy, with chemistry on Monday, Tuesday, and Wednesday. Wednesday is especially difficult, as I usually leave this lab after 10 pm on the previous night, then get to work at 7 am so that I can leave at 4 pm and stay at my other lab until 10 pm. Did you find the problem with this picture yet? 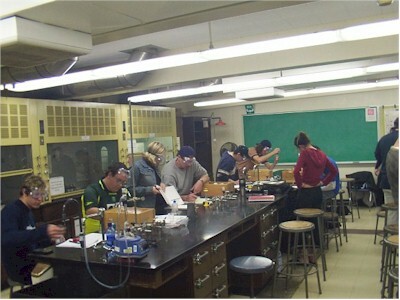 If you noticed that the guy second from the left is not wearing his safety goggles, then you might make a pretty good chemistry lab instructor.